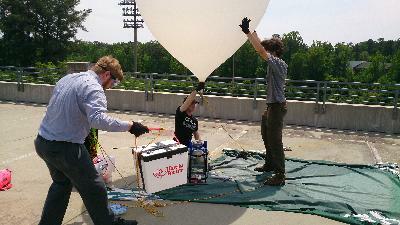 Students for the Exploration and Development of Space at North Carolina State University, conducts interdisciplinary research projects, connects students with academic and career opportunities, and explores the question, "Why go to space?" Meetings are Mondays at 5:00 PM, in Engineering Building I room 1010. This is accurate as of 9/14/2015. We launched a balloon up to 60,087 ft. (highest APRS ping; probably got higher), and then it came back down in a stand of trees. Not the open field right next to the trees, but in the trees. 30m up a pine tree with no low branches. After...four? Five? Some large number of retrieval attempts, we managed to get the balloon back down. The combined efforts of a bow, fishing pole, several lengths of string and rope, and a grappling hook were able to dislodge the payload. Thanks to Tim for his help! We had some identified issues with the APRS after it got in the air, but we did receive five packets. We'll post a link to the video it took after someone uploads it to YT. We had a workshop for teaching people how to Arduino. LEDs were blinked, pins read and written, nobody remembered to take pictures, and I pulled Eli's cable out just before he could brick his Arduino. Surprisingly, only one person had computer problems with the Arduino IDE, so I'd say it went pretty well. 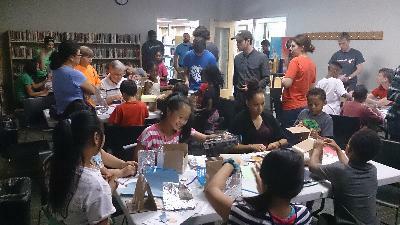 The Richard B. Harrison Community Library hosted an outreach event for elementary school children, and we partnered with AIAA to create activities for the children. They built space bases out of paper and popsicle sticks, made bottle rockets, and went through an astronaut training obstacle course. Personally, I was expecting all the space bases to be covered in guns, but these children didn't seem as militaristic as I'd expected. The first one I talked said she was building a robot, and when asked what kind of robot, said 'a PEACEFUL robot'. It was probably good for the robot to be peaceful, since a robot made of construction paper may not hold up well in a fight.